Not long ago Sharp launched a new line of MFPs with a capability of wireless connection. Four new models allow companies improve office workflows, using the most advanced technological solutions. The main advantages of these multifunctional devices are high productivity and print speed (up to 51 ppm in color and monochrome modes). However their most significant feature is multiple wireless connectivity (to a cloud, to different operational systems, to mobile devices), what helps go with the tides. Sharp has broadened the function of its MFPs from simple data handling units to networked digital systems. The models are equipped with the high resolution 10.1’ touch-screens, providing the full and instant access to Internet and cloud applications, allowing users to find the needed information quickly and check e-mail as well as attachments at once. 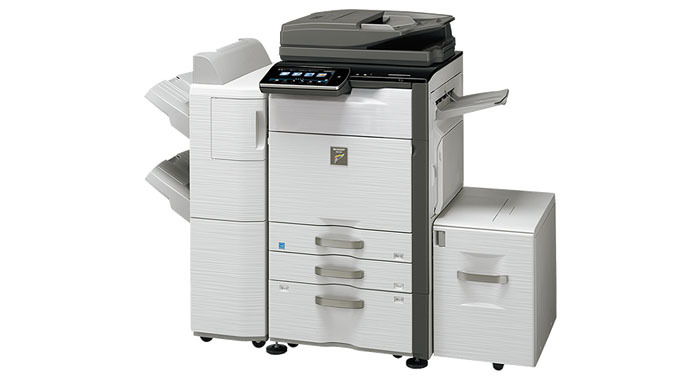 Besides the default functions of printing, scanning and copying, MX devices provide such significant functions as Sharp OSA 4 platform (Open Systems Architecture) for simple integration with network applications and cloud services, PCL and Adobe PostScript 3 support, broad choice of paper trays (with maximum capacity of 6 600 pages), efficient network security for reliable user identification, encryption and data deletion.